Most of us love blueberries, that’s a given. A favorite treat during the summer, I love coming home from the farmer’s market in July with baskets of fresh berries. Simple toppers for cereal, waffles, smoothies, or on their own. Like most summer produce, once Labor Day is over, it’s hard to enjoy them in the off season. If you’ve ever had a fresh tomato in December, you know what I’m talking about. Sure, it’s still a tomato- just without the juiciness and sun-kissed flavor. Same goes for summer berries, especially the blueberry. Since blueberries are not only delicious, but filled with antioxidants, I’ve continued to enjoy them in a different variety: frozen. I get the question of fresh vs. frozen a lot and my answer may surprise you. Frozen produce without any additives or sweeteners is just as, if not more, nutritious as fresh produce. That’s because fruits and vegetables sold frozen are chilled soon after harvest, when they have peaked in ripeness and nutrient content. My freezer is packed with frozen fruits and vegetables. Besides being less-expensive than fresh produce, they are also already prepped and chopped- making smoothies and meals simple and fast. Since I love blueberries in my morning smoothies, I have become fond of smaller, wild blueberries. The taste is incredible! Much more intense than regular blueberries, they also contain twice the antioxidant amount of regular blueberries. They are rich in anthocyanin, an antioxidant with anti-inflammatory properties that may help prevent chronic disease. A fair warning, if you make this jam you may never go back to buying regular jam again. 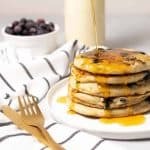 Not only is it so, so easy (prep time: 10 minutes) but it also contains omega-3 fatty acids, fiber, and a ton of antioxidants (thanks to wild blueberries & maple syrup). If you don’t have a high speed blender you can microwave the frozen blueberries for a minute until soften and mash gently with a fork. Then, prepare as instructed below. This was an easy breakfast on sourdough bread with sunflower seed butter but enjoy this any place you would jam! Stirred into yogurt, oatmeal, overnight oats or as the base for a quick smoothie. Place wild blueberries in a high powdered blender and pulse them a few times until broken up. I like my jam to have bits of berries in it, but you can pulse until a desired consistency is achieved. Combine wild blueberries, chia seeds, maple syrup and water into a jar. Cover and shake until combined. Let sit overnight in the refrigerator to set. In the morning, you will have fresh, minimally processed jam! Do it! 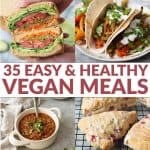 You won’t be disappointed- and then you can enter a whole new world full of chia pudding, smoothies, dressing 🙂 It’s funny how often I use them now when I didn’t know what they were a year ago! Hi Alex, I bought some chia seeds this week! I’m looking forward to using them, and now I will add this jam to my list of recipes to try. This is a great recipe to start out with! Let me know how it turns out for you! Yum! This jam sounds delicious. I just finished up the bag of wild frozen blueberries I had in the freezer. I usually add them to oatmeal, so this jam would be the perfect addition. Love the addition of chia seeds! Simple, creative, and healthy! I want to spread this on my toast every morning ;). I’m throwing a brunch bridal shower this weekend and I’ll definitely be making this jam! Thanks for sharing! Hi Alex! I love your method for making jam! I heard a lot about chia seeds, sounds like a great way to try them! Thanks Cindy! I hope you like this recipe, it’s so simple and flavorful. 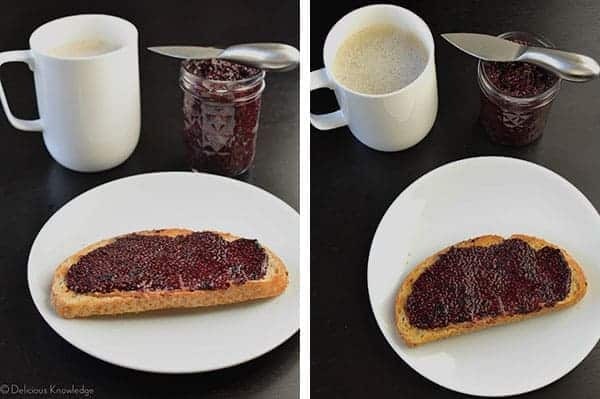 I don’t know if I’ll go back to regular jam! I love making jams with chia seeds. Such a great idea! Thanks for stopping by Sarah Grace! 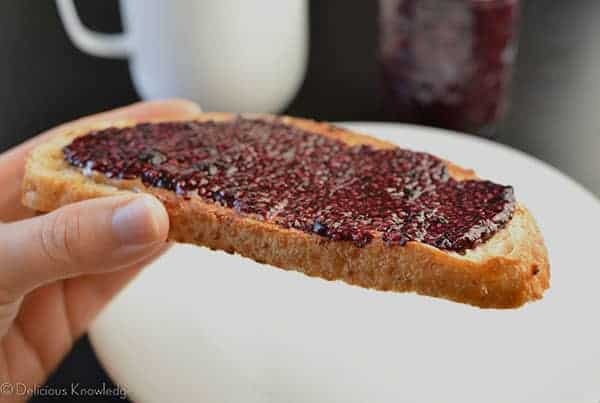 Why have I never thought to make jam with chia seeds? So smart! Would be great mixed into Greek yogurt too! 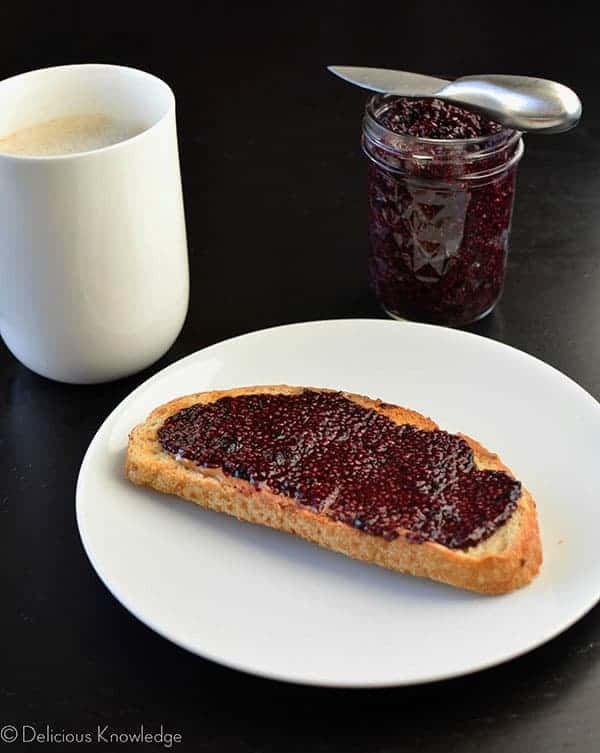 I think it’s so cool how the chia seeds thicken the jam … while adding great nutrition. I really must get on the chia seed bandwagon! I’m totally going to try this recipe!